In President Barack Obama’s last year in office, a new Pew Research Center survey finds that views of the United States remain strongly favorable in key European and Asian nations. 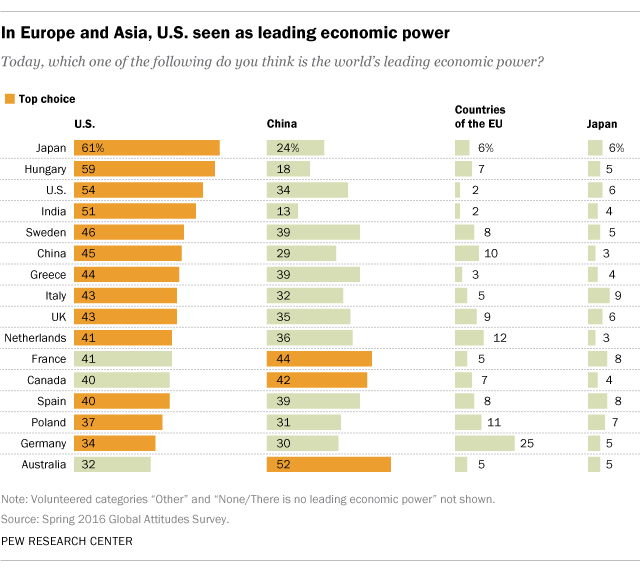 Compared with China, the U.S. is viewed more favorably and seen more often as the world’s leading economic power. Obama continues to receive high confidence ratings, and across the 15 countries surveyed, his former secretary of state, Hillary Clinton, gets considerably higher marks than Donald Trump. 1 Views of the U.S. remain positive, especially when compared with China. Half or more in almost every nation surveyed have a favorable opinion of the U.S. The highest marks for the U.S. are found in Poland, Italy and Japan. About half or more of Indians and Chinese also have a positive view of America. The only country surveyed in which views are negative is Greece, where only 38% have a positive opinion of the U.S.
China receives lower ratings than the U.S. in virtually every country surveyed. This includes positive ratings of just 11% from neighboring Japan, and 31% from India. European countries also see China negatively, with no country expressing majority support except Greece, where 57% have a positive view of China. 2As the U.S. economy has slowly grown and added jobs, and as China’s once astronomical growth rates have waned, the percentage of Europeans naming the U.S. as the world’s top economic power has increased, while the share naming China has declined. In 2016, many people across the nations polled say the U.S. is the world’s leading economic power. Australia stands out as the one nation polled where at least half (52%) say China is the top economy in the world, compared with 32% who say it is the U.S. Relatively few respondents in these 16 nations think Japan or the countries of the European Union are the globe’s leading economic power, although 25% of Germans say it is the EU countries. 3 Across most nations surveyed, confidence ratings for Barack Obama are high. This includes over 80% confidence in his ability to handle international affairs from people in Sweden, the Netherlands, Germany, France, Australia and Canada. Confidence in Obama’s international abilities is lower in China (52%) than in most of the other countries surveyed, but it is still positive. Meanwhile, Greeks are the most negative toward Obama, with 58% expressing no confidence in his ability to handle world affairs. Among Americans, about six-in-ten (58%) have confidence in Obama’s handling of world affairs, but views divide sharply along partisan lines: 92% of Democrats have confidence compared with only 21% of Republicans. 4 Overall, people in most of the countries surveyed across Europe and Asia have confidence in Hillary Clinton and her ability to handle international affairs. Donald Trump, however, gets negative ratings in nearly every country surveyed. The most confidence in Clinton comes from many of the same places where Obama and the U.S. are broadly popular, such as Sweden, Germany and the Netherlands. Much smaller shares in Greece, India and China have confidence in her, although in many places where her confidence ratings are low it is because many people do not offer a response. 5 People in Europe and Asia see both good and bad qualities in the American people. On the positive side, half or more in 15 of 16 nations say Americans are optimistic, and majorities in 14 countries think Americans are hardworking. However, when it comes to tolerance, fewer than half in 11 countries say that they associate tolerance with the American people. Majorities in the U.S. describe Americans as hardworking (80%), optimistic (74%), and tolerant (65%). On the negative side, half or more in 10 countries think Americans are arrogant and many say they are greedy. And half or more in Australia, Greece, the UK, Spain, Canada and China say Americans are violent.